When you consider your own landscaping options, there might be some decisions on whether to hire professional lawn care or if you can do it yourself. This article will outline some of the basic considerations you’ll face so you can approach do-it-yourself lawn care with confidence. Where do you start with getting your lawn in shape? Every solid project requires a good foundation. The foundation for a good lawn is the soil in which it grows. If you have soil issues, you will have lawn issues. Perform a soil test for your lawn soil. This will give you valuable information on what your soil has and what you need to add to it. 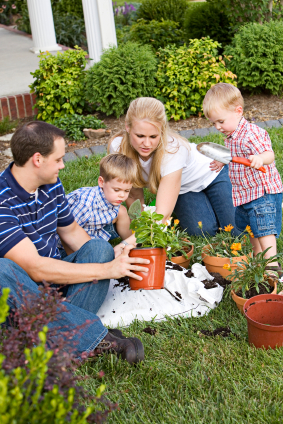 There are do-it-yourself kits available from some lawn care services or lawn and garden shops. The cooperative extension offices in many states will also test soil for free or for a low fee. Private companies also provide kits and testing for a fee. Once you get the results returned, you will see what you may need to add to the soil in order to get the lawn of your dreams. What type of grass seed should you use? The type of grass you have in your yard depends on your location. For people living in the hot areas of Florida and other subtropical zones, St. Augustine is likely the local neighborhood favorite. In other areas of the country, there are additional options. Tall fescue or Bermuda are both popular choices in many areas of the country. If you are aware of the type of grass you have in your yard and are content with its health and the way it looks, simply learn more about how to treat it well. If you are starting fresh, make sure you select a grass that thrives in your geographic area. One good tip is to locate the best-looking lawn in your neighborhood and initiate a conversation with the owner. They can give you a good idea of what types of seed, fertilizer and watering schedules might also work well in your yard. How Do You Get Grass Growing in Shady Areas? Most grasses require at least four hours of sunlight every day. If you have an area that doesn’t receive that much sun, you still likely have a couple of options to get the lawn you desire. Find a seed mix that works well in the shade. Many fescue blends, for example, will work very well for you in the shade. That is great news for people that live further north, as well. In the south, St. Augustine is often the grass selected because it grows well in shady areas. How do you plant new grass? Planting new grass is actually a simple procedure for most homeowners. Loosen-up (aerate) the soil. At a minimum, start by raking it vigorously with a dirt rake. Spread the grass seed evenly over the tilled area. You can do it by hand or use a seed spreader for larger areas. Cover the seed with a light layer of soil. There are treated soils available that provide balanced nutrients encouraging the growth of new grasses. Water appropriately. Keep the soil around the seed moist until the new grass grows as tall as the grass around it. If you overwater the grass, the seed will drown. If you don’t water it enough, the newly sprouted grass will dry up and die. How should you fertilize the lawn? Fertilizing provides your lawn with the nutrients it needs to grow thick and green. In order to fertilize a sizable lawn you will need a spreader. Spreaders come in two varieties: drop and broadcast. Drop spreaders drop the fertilizer directly below the spreader, while broadcast spreaders drop fertilizer in a pattern out and away from the spreader. Drop spreaders are more accurate while broadcast spreaders cover larger areas in a shorter amount of time. Load the fertilizer into the spreader’s hopper. Each spreader has a setting that will allow you to control the amount of fertilizer put down. Follow the directions on the fertilizer bag to get the right setting for your spreader. The first step will be to lay out a perimeter line of fertilizer. That means taking the spreader over the edges of the lawn and spreading fertilizer. With the perimeter completed, begin walking the spreader back and forth over the lawn in parallel lines. As you approach the fertilized perimeter, turn the spreader off so you don’t run over the same area twice. Spreading the fertilizer in this manner will take some time, but the results are well worth it. When should you fertilize and seed your yard? You should do both during the cooler parts of the spring and fall. In southern states, you can do it in the Spring between February and April. in the Fall, you would look at doing it between October and November. In the northern states, the Spring seeding would be handled from April to early June, while the fall seeding might occur between September and early October. have mushroom growing on the lawn. What was the answer to mushrooms growing in the lawn? I also have some kind of fungus growing around sprinkler heads, very tough stuff, have needed a hachet to break it loose. What is this and what can I do to get rid of it? Water early in the morning, not in the evening or at night. Just before the sun comes up. That’s what I heard too, but they make my flesh crawl…..absolutely HATE mushrooms! no that means you have a fungus in the soil = not good! call TruGreen! mushrooms growingf in lawn. how do you get rid of them? If you have mushrooms in the yard, you are watering the yard too much. This means you have rotting wood under ground. Mushrooms are a fungus. Can you recomend a fertilizer that will not stain concrete or pool finish? You should remove all fertilizer from your hard surfaces. Then it won’t stain. Use a blower and blow it in to your lawn. Waste not what not. This also reduces the amount of chemicals that make it to the waterways. You should always sweep/wash any fertilizer off of concrete surfaces. To leave it there is just plain lazy. It irks me when my neighbors don’t remove it and my dogs have to walk through unknown chemicals on their walk. I own a small business and we are starting to break into lawn care a little bit. I laid down a spring weed and feed today and one of my customers wanted to over-seed and did not tell me. The bag of fertilizer says wait four months to seed. Is there any way i can use seed earlier than what the bag says? no it would burn the seed and be useless. The pesticide recently put down WILL inhibit the germination of the seed. 4-6 weeks is needed before seeding. Make sure you are licensed for putting any pesticide down commercially if you aren’t already. Just reseeded my lawn this weekend. You mentioned not over watering, but how much is too much? Is mowing wet lawn harmful to the lawn and if so why? Mower will chop and tear the grass leaving it jagged and subject to disease. The grass may also get rust and it will look brown. You should not water later than noon and you should not mow wet grass. My lawn turned to yellow from green in just the past few days after the spring sprouts already started. In the last two days we had constant rain but I don’t see any green improvement. Could this be a sign of disease? Thanks. Hi Cathy! I myself was having same problem as you are. Just bought my home in February and when spring came I noticed my lawn was brown and dead in places but it is improving as green sprouts are coming in. To answer your question have a soil test done. I did and it showed me what my soil lacked and what fertilizer i needed to apply. You can find out your self if your grass is diseased by insects by grabbing your grass near the soil if it pulls out with no problem this is an indication of insect disease to your grass. You can get a soil test kit at lowes or home depot. it will let you know what your soil needs to green up your lawn. Some people just by any fertilizer but you need to be careful if you dont know what your lawn soil is lacking you could burn your lawn with applying the wrong fertilizer. I have some brown spots in my lawn, the grass appears to really be dead, it leaves bare ground. I have been told my little dogs peeing on the grass is the culpret, is that true. Why does that happen and what can I do to short of get rid of the doggies? Get some Lawn & Garden Gypsum. It works on pet spots and winter damage from salt. Dog Urine contains ammonia and toxins that can kill the grass. Over time they take their toll and leave bare spots like you describe. A couple spoon fulls of tomato juice in your dogs water or food will neutrilize the acidity of their urine. Been using this method with my dog and my brown spots are gone. Give your dog brewers yeast tablets; it’s a vitamin, that will prevent their urine from killing any lawn. dead grass spots and patches. Grubs and other pests can cause this yellowing and then worse as they feed on your grass’s roots. A soil analysis or investigation by pulling up some of the grass to see the soil underneath could reveal the problem. Most any broadleaf weed killer will do it. Make sure you don’t get product that will kill everything. I have seem many people spray a ’round-up’ or similar product and kill the lawn. Weed and feed. lightly water lawn before applying, so fertilizer sticks to the leaves of the clover. Dandelion, clover, plantain are broadleaf weeds. The best time to apply a general-purpose broadleaf herbicide for the control of perennial broadleaf weeds such as dandelion, plantain, and clover is early September to early November. As winter approaches, perennial broadleaf weeds are storing energy reserves in stems and roots; a fall-applied herbicide will enter the plant and travel to these plant parts with the food reserves. The second best time is in the late spring or early summer period after the weeds have flowered. If applying in the late spring, be extremely cautious with these herbicides near ornamentals, trees, flowers, and vegetable gardens because these plants can be damaged by these herbicides through direct application, drift, and/or volatilization (the herbicide turns into a vapor). This is another reason why we prefer to apply these herbicides in the fall. I seeded my front lawn last year and after much rain here in FL it seems to be doing well but is very spotty. Should I consider repairing it with plugs as well as large pieces of sod? I don’t want to kill the new growth it has a good root system. Thank You. Aerate and reseed. That will help or just patch seed. Just got a new house. The lawn is full of crab grass. What is the best way to get rid of it. Also when is the best time of the year to reseed turf grass? You can get a crabgrass killer and spray. Many apply a pre emerge product in early spring – late February to end of March depending on where you live. The best time to seed is fall. The weed seeds have passed their time to germinate and your grass seed will be off to a good start before winter. Most areas of country you can plant grass seed Labor Day weekend and have good results. apply fertilizer in late October and keep the roots growing all winter. You will have a healthy lawn in April. weed problem. looks like a bumper crop of all kinds of them. our grass is healthy, but the weed situation is overwhelming. We are having a problem with an overwhelming weed growth. We have used weed control, crabgrass preventer and such. What do you think of this. our grass is healthy, but the weeds seem to be in control. I HAVE 2 OAK TREES IN THE BACK WHERE THERE IS NO GRASS; NICE SHADE BY NO GRASS. THERE ARE ALOT OF LEAVES THAT FALL TOO, WILL IT HURT THE NEW GRASS SEEDS??????????????????? Remove any leaves that fall and use a shady seed. Also aerate and reseed after all the leaves have fallen and you removed them. This way in the spring the new seed will grow. Can someone overwater their lawn? Can over watering kill your lawn. My Husband floods the lawn everyday. I suppose over watering could damage the lawn or even kill it by inviting insects or diseases. Flooding isn’t necessary unless you have very sandy soil that simply wont hold any moisture or you enjoy mowing. Water with a sprinkler system daily if necessary and besure to mulch when mowing, this will help add some needed organic matter to the soil. Don’t forget too much moisture! Hi Scott, although many people think the pH level is wrong when you have moss growing in a lawn. The most common reason for moss growing is a shaded damp area. Without a constantly moist soil, moss will not grow no matter how hard you try. Increasing sunlight, thinning out trees or large shrubs above the moss area and letting the area dry out between watering will help the grass grow and keep down the moss. You will almost never see moss in a sunny area of the lawn no matter what the pH is. I agree. Now, I have cut down 2 trees and thinned out the other trees in my back yard. How do I get rid of the moss? I just had my yard aerated two days ago and the temperatures went from 70 to 45 degrees. Before I had the lawn aerated I raked up the leaves. Now since the lawn was aerated my neighbors leaves have blown over in my lawn. Is it two late in the season to plant grass seeds? If so, can I just spread the seeds directly on the leaves? Or would it be in my best interest to wait until early spring 2012? Who ever aerated your lawn should have seeded it. If it was aerated by a Professional they should have seeded it. That’s what happens when you try to be cheap and think I can seed it myself. If they would have done it, your lawn would have been done already and you could be enjoying a nice lush lawn. It wouldn’t have costed you that much more. how do i makew my lawn more level? I have areas that are about 6 inches deep in my lawn, making walking difficult. also, i have a small dog and want to get rid of chinch bugs and kill the weeds too! any ides? I live in the panhandle of Florida and landscape pros here use white sand (can be purchased at home centers) and apply a a quarter inch, or so, to allow grass to grow through it. It may take a few applications to get it level. I’ve done that on a zoysia lawn and it works well. Purchase bulk top soil (its cheaper) and fill in the spot. Consult a professional for the cinch bugs and weeds. Or have them do it all. Hi. I’m a total do-it-yourself-er and I appreciate your lawn care blog. I was wondering if you could share more about aeration. Especially doing it yourself. I made my own aerator that I could pull behind my mower. I posted a clip of it on youtube. I think it works pretty well but kinda would like to know more about how often and when to aerate. Good site with lots of good information. Good info on watering and fertilizing. Both very important factors in growing a nice lawn. Thank you. Love the post very interesting about seeda, sod and when to install or plant them. Wish you were on Twitter I would have liked to fwd this to my followers. If you are ever in our “neighborhood” stop in say hi love to hear from you. Good Article, Very Informative! Great tips for DIY lawn service! Help. Whole back yard is weds…no grass and lots of trees…weds up to my knees….and 2 inches thick…. We have serious mole/vole issues — how do I get rid of this? I’ve caught over 15 moles in the last 2 years. I bought several traps but none of them worked. Then I tried the scissor traps and they always work for me. Now my neighbors are using them also. I have a yard that has what I understand is broad leaf. I’m think about buying a $250, 25 gal. sprayer. I have about an acre to do. What type of chemical do I use and when do I use it. Can I fertilizer and aerating my lawn at same time? Hey nice blog. Thanks for the tips. How do I keep gophers and snakes out of my yard? Every year in summer, the edge that the lawn runs along the concrete gets burned. I have replaced, reseeded, fertilized and put extra water, but it didn’t help. Should I put the flat rubber edging or should I put the vertical edging to stop the heat from the concrete from burning the lawn? Southern Oregon and 2300 ft. above sea level shouldn’t be this difficult. We have dead spots of grass in alll different shapes. In about the same area.. We do have a Yorkie, but she doesnnot go in that area. We also have dead spots in the front yard only a few. Dog never goes there. We live in Gillette WY so that area nis under snow an big part of the year. How do I eradicate my lawn of moles? My husband says that they aerate the lawn and I shouldn’t be concerned. Is that true? I am trying to discourage cats from leaving “gifts” on my front lawn. Coffee grounds seemed to work, but I need more grounds that we generate daily. I got too aggressive and tried straight vinegar which worked great to discourage the cats, but has killed the beautiful green that we had growing. It has interesting designs where I have used the vinegar. How do I get rid of both the designs and the cat visits? i used weed killer on my lawn –now i have light brown grass on spots where i sprayed–how can i correct this? What is the best heighth for grass in the hot weather? I have a large ring of mushrooms in my lawn in summer. Are they edible? They are white, and when mature are about five inches across with a slight indentation in the center. I think they are Fairy Ring mushrooms. What could they be? How high (in inches) should I cut my lawn. I live in England. PH in my yard is 7 but I still have moss growing on the edges of the yard (up against the fence) and up against the house. What product and/or methods can I use to kill the mostt? I live in Charlotte, NC. Thanks! Great tips on great lawn care procedures. Everything mentioned is vital to lush, green lawn! I have a one year old lawn and this summer the grass is very slow to grow. it is not brown but then again its not a deep green either. also there are hundreds of tiny mushrooms growing in the lawn. I have always heard that if you hav emushrooms you have a health lawn. Are there any thoughts or sugestions? Last fall the grass was a deep green and grew rapidly. We live in the Northwest and this has been an exceptionly wet spring and early summer. Lawn is fine but daisies forever growing is it possible to get rid of them without having to replace my lawn? I have always watered early in the morning but lately all the news programs state that since our daily temperaures are 100+ we should water in the evening since all the AM watering be harmful. What is the correct way with hot windy days? Pre-emerge crabgrass treatment didn’t happen this spring because of other renovations that were taking place. Now my lawn is overrun with crabgrass. Shall I just wait until the Fall or can I do something now?? What is best to use. I live in a development where there are lots of kids and pets. How long should I wait to overseed after treating with weed killer? I put in sod last March and the lawn is doing great but in a few areas my grass is turning yellow. What is the cause and what should I do about my problem? I live in northwest Florida and I have St Augustine grass. Our rain fall has been very good this year. We just started a lawn care blog in Austin http://www.emeraldlawnsaustin.com/blog and love your blog. Let us know if you want to share information or posts sometime. Where are you guys located? I have violets all in my back yard. What can I do to get rid of them. On contractor put a weed killer on them and it almost killed everything but the violets. HELP! I recently landscaped my backyard any layed sod. Over the past month I noticed that there are areas that stay wet longer than desired. Is there a way to correct this issue without lifting the sod? I LIVE IN NEW JERSEY AND WAS HIT WITH “SANDY’. I HAD 3 FEET OF SALT WATER OVER GRASS. WILL IT SURVIVE??? Hi, I have a large Spruce tree in the center of a small back yard. from the Spruce tree as possible. 2. Next prepped ground and brought in about 2.5 inches of sandy loam soil. 3. Fertilized soil according to instructions. 4. Planted the area with sod. Sod took great looked good for the spring and summer, and fall. bare patches, thinning in most area’s, grass generally looks terrible! We follow much of this advice at Saber Lawn Care. Our clients love our work and this next spring looks to be even better than last year! A good site to follow. If anyone needs a professional in Central N.J. Very informative article I’m sure that many do-it-yourselfers have gained alot of knowledge from visiting your site. I like that you’ve mentioned about the soil testing that you can have done or do yourself, I’ve found that to be extremely helpful with my lawn care clients that I service. AffordaLawn is the name of my Lawn Service, we service customers in both Missouri and Kansas and doing a soil test along with the first service for new clients have made us alot of happy customers later in the year. Many tell us they’ve never seen their lawns look so good. Kinda makes it easy though when you know what their lawns in need of. I live in Ohio and last year the summer was hot and dry. I have a lot of dead spots in my grass. When should I reseed those areas? Should I reseed the entire yard? I have a lawn service for weed and feed. Should I plant before or after they treat my yard? I live in michigan. When is a good time to put spider/bug killer on my lawn? Can anyone recommend the necessary amount of time that I should be watering my lawn in Utah? Also, I have small “Bumps” all over my lawn. Could these be caused by some kind of animal? If so, how can I get rid of them. Also, I have some spots in my lawn that WILL NOT grow no matter how much I water or plant seeds etc. Any recommendations would be greatly appreciated. In Shady areas I like to plant the fine bladed Zoysia grasses. Saint Augustine is a bit weedy looking for me. Some people like the cavalier zoysia because of the fine blades like perennial rye grass has. What is the most economical way for me to start grass on my lawn that is nothing now but weeds?? I need information on the most economical way to start grass on our lawn that now has only weeds?? Thank you very much , that was very informative . Really great website here, lots of informative material for people that enjoy working on their lawns themselves. I like the information about doing the soil test for your lawn, I have had alot of success after knowing what the soil needs to grow grass from doing this test. I have a small hill. I like to walk and the hill is at the end of my walk but Im afraid of falling. What can I do to make it more safe ???? how to get rid of bunch grass in lawn? What height should I mow my grass? Nice tips. With our Tulsa lawn custom pre-emergent and post-emergent weed control system, lawns are virtually weed-free, requiring less time and attention to maintain. in my yard? The holes are 1-2 inches diameter and 5-6 inches deep with dirt piled around the opening. I’ve not seen any insects, however it must be some type of bug. Any ideas? There are a lot of questions on here but few answers. I’d like to see more answers the questions being asked. Thanks. I have a very small yard in Maryland and am trying to research how to manage and grow healthy grass. (How and When?) There are many weeds currently growing in it (and a few mushrooms popped up last summer) and it is often very wet and buggy. Any suggestions about how to get started? I live in Northern New Jersey and here is my issue….My lawn tends to get CRABGRASS come summer time. I would like to put down pre-emergent fertilizer/crabgrass preventer right now in the early Spring. I also have patches in my lawn that requires seeding. The issue is that all fertilizers/weed preventers read on the bag “do not seed for at least 8 weeks from fertilizing” My question is, should I seed now (early April) or put down the fertilizer and deal with the bare spots??? 2. Now that this harsh winter is over, I have lots of dead grass, brown grass, grass that looks almost like hay, and brown leaves; should I rake up or leave as nutrients to help grass regrow and green up? @Bill: Agreed. After mulching, keep the area clean from weeds by weed eating the area once per week to prevent any foilage overgrowth. This will help maintain the grass’ color and will improve the aesthetics as it carries over into the mulch (brown compliments the green well on a color palette). Good luck! I live in New England, in the woods where there is about 4 hrs of sun at minimum to some parts of my lawn. The soils is acidic due to the pine trees…my problem is that my lawn is turning to mostly green moss vs grass that was once there. What can I use to get rid of the moss and have the grass grow again ?